10 Amazing Aquariums that both educate and inspire! Did you know that P.T. Barnum built the first public aquarium in the United States in 1856 and that the oldest public aquarium in the United States had to close its doors in 2013 because of lack of funding? It was called The National Aquarium, in part because of it's location in Washington, DC, but it was founded in 1873 in Woods Hole, Massachusetts. 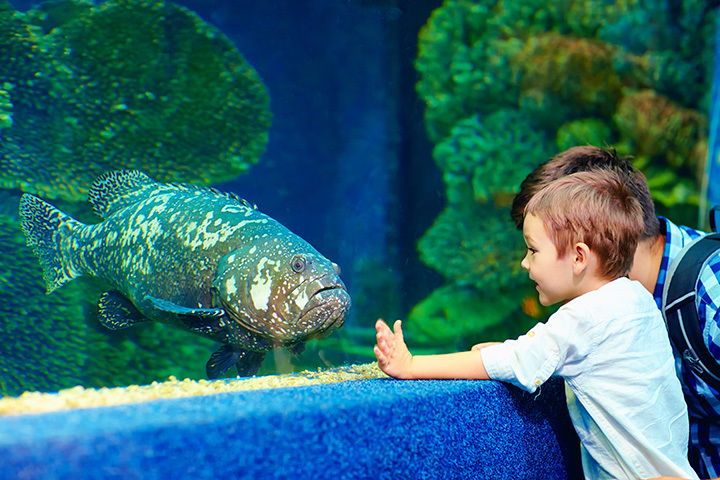 Aquariums of all shapes and sizes can be found across the country, sometimes as counterparts to zoos that offer us a chance to see animals in an approximation of their natural environments. Many of them have as their charter the need to educate and spread the word about the importance of conservation. All of them have the ability to slow down our minds for at least a few seconds as we watch a fish float by or find ourselves in full grin at the antics of the penguins. We've found 10 of the best aquariums in the United States where you can sit, walk, dive, watch and even sleep with the fishes. Take some time to shake off the cares of the day and unwind with the fish and amphibians that inhabit the Shedd Aquarium. Set in an unique location on Lake Shore Drive in Chicago, the Shedd was voted a Travelers Choice attraction by TripAdvisor. They believe in sustainable practices and in getting children, educators and visitors involved in learning experiences that will be remembered for a lifetime. The Audubon Aquarium is part of the Audubon Nature Institute, so you can spend the day going from aquarium to zoo to butterfly garden and insectarium! At the aquarium, purchase a backstage pass to pet a penguin or walk through a Maya Reef to explore a submerged Mayan city. As a Ripley's property you can count on a few "I didn't know thats" and many more "look how cute!" moments, especially at the Penguin Playhouse. Visit the Tropical Rainforest, Shark Lagoon or plan a sleepover. It's a bit pricey, but the aquarium welcomes overnight visitors who are treated to a scavenger hunt and "late night activity" before sleeping with the fishes. The North Carolina Aquarium offers a look at the local habitat where freshwater streams meet coastal environments and where you can "meet an albino alligator," "talk to a scuba diver," or "touch a shark," (or watch someone else touch a shark). Their mission is to inspire an appreciation for and the conservation of North Carolina's aquatic environments. In their new Living Seashore exhibit kids are encouraged to reach in and touch the sea creatures, like snails and jellyfish and if you like slimy animals, they have those, too. Go behind the scenes with a guided tour or spend some quality time with a "dolphin encounter" or "shark sleepover." The Oregon Coast Aquarium has 15,000 animals across 250 species like seals and sea lions who are at the center of an attraction that concludes with a "whiskery" kiss. Members and others pay extra to dive the aquarium, but for those who would rather watch, spend some time with their "Aquaria-Cam" or stroll through the shipwrecks exhibit. Rockhopper and king penguins are there along with a shark tunnel where you can walk slowly along, surrounded by swimming sea creatures like turtles, stingrays and sharks. Conservation is big at the aquarium and the zoo and volunteer opportunities abound. You can even plan an event with the zoo and aquarium as the backdrop. Learn about the Pacific, the world's largest ocean and then purchase a ticket for a whale watch and dolphin cruise, so you can see them in their native environment. Other add-ons include a behind the scenes tour or add a visit to the USS IOWA. The Texas State Aquarium is dedicated to promoting environmental conservation and rehabilitation of the wildlife of the Gulf of Mexico. It is a not-for-profit educational facility where education is the "cornerstone of their mission" and where they encourage a love of Science, Technology, Engineering and Math (STEM Education). Visitors are treated to daily dive shows, animal feedings and training sessions. You can feed the stingrays or watch divers feed the wildlife swirling around a Texas coral reef. The Downtown Aquarium in Denver is part of a chain designed to offer entertainment as much as education. Tables and chairs are placed amongst the tanks, so you can relax and even dine with the spectacle of fish, divers or mermaids swimming by. They've added a 4D theater to the attractions and you can rent the venue for unique events.